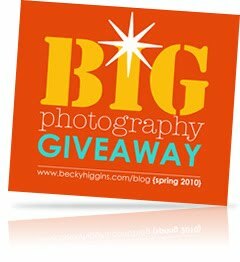 Nikki Scott Photography: Big Photography Giveaway! It's finally here! I'm featured on Becky Higgins Blog! I adore this woman ~ she is a creative queen and I am so excited to be a part of this latest idea of hers. This is such a great give away that she has organized, not to mention alot of work. There are over 150 photographers throughout the US and Canada that have volunteered for this awesome project. If you think you would like a FREE family portrait done for yourself or want to nominate a deserving family go on over to Becky's Blog and leave a comment under my photography feature. You have one week to leave your comment and I will pick a lucky winner! Have fun!